Zappos.com is proud to offer the Acorn Kids – 11205 (Toddler/Youth) (Turtle Blue) – Footwear: The Roxie slipper bootie is the perfect addition to any sleepover. ; Printed fleece upper is soft and warm. ; Cozy microfleece lining wicks moisture to keep your feet warm and dry. ; Acorn&#8482; memory foam midsole over a cushioning layer of lightweight EVA is like a pillow for your feet. ; Pull-on styling with elastic at the shaft to ensure a secure fit. ; Weatherproof outsole is perfect for indoor/outdoor use. ; Shaft: 6 1 2 in ; Circumference: 9 3 4 in ; Weight: 4 oz ; Product measurements were taken using size 9.5-10.5 Toddler. Please note that measurements may vary by size. Zappos.com is proud to offer the Acorn Kids – Polar Moc (Toddler/Youth) (Turtle Grey) – Footwear: You don’t have to live at the North Pole to appreciate the warmth and comfort of the Polar Moc. ; Printed fleece upper is soft and warm. ; Cozy microfleece lining wicks moisture to keep your feet warm and dry. ; Acorn&#8482; memory foam midsole over a cushioning layer of lightweight EVA is like a pillow for your feet. ; Slip-on styling. ; Weatherproof outsole is perfect for indoor/outdoor use. ; Weight: 3 oz ; Product measurements were taken using size 1-2 Youth. Please note that measurements may vary by size. This is a definite Friday Find for the gardener in your life. Turtle Faucet Decorative, Functional & Fun Our faucets have been turning since 1978. These decorative and functional faucets are made from 100% recycled solid brass in America. Great way to personalize your garden work space. Sculptured handles & Solid brass faucets Mounted on 3/4 inch brass hose bibs. Custom Made in the USA – Lifetime Guarantee Easy & Quick to Install Great Gift Idea Ships in 2-4 Weeks About Whitehall Products Behind the legend of Whitehall artistry lays the tale of a unique craft inspired by the majestic shores and woodlands of western Michigan. It was a master wood carver’s desire to reproduce and preserve his hand carved wood sculpture in metal, depicting the grace and essence of America’s natural beauty. Over 65 years later, Whitehall Products still offers you the same mastery in detail with each originally designed, carved and hand cast product. Over 65 Years of Manufacturing Excellence Renowned as the world’s largest manufacturer of weathervanes, Whitehall is also recognized for its extensive line of personalized home address plaques, mailboxes, and garden accents such as hose holders, birdbaths, birdfeeders and sundials. Whitehall’s home accent collection includes unique indoor/outdoor clocks and thermometers and personalized doormats. David Dunleavy`s inspirational style graces these Creature Feature checks. Showing his passion for undersea preservation, these checks will make a statement everywhere you use them. Break Out of Your Shell with These Turtle Tides Checks – If it’s their slow walk, distinguishable shells or affinity for swimming that makes you love turtles, using these turtle art checks from Bradford Exchange Checks(R) will be a day at the beach! Illustrated sea turtles on land and in water are featured on these checks in four colorful designs by artist Paul Brent. Whether it’s two turtles playing in the sand, or five turtles taking a dip, these turtle art checks are cause for shell-ebration! Plus, you’ll find these sea life check designs are just as practical as they are playful. Brought to you exclusively by Bradford Exchange Checks, they’re expertly re-created with premium-quality check printing. Don’t miss this terrific opportunity to showcase your love for sea turtles every day – get your Turtle Tides checks as soon as possible! Order now! Pricing shown is for 2 boxes of Singles. Turtle Checkbook Cover Shell-ebrates Your Love for Sea Turtles! – Let the world know how much you love sea turtles with this artistic genuine leather checkbook cover! Custom designed to coordinate with our Turtle Tides personal check designs, this checkbook cover features five friendly turtles swimming together. The curved design of the leather border complements the undulating sea, perfectly captured by artist Paul Brent. Plus, the ocean design flows over the fold and on to the back!This exclusive sea life checkbook cover is handcrafted of genuine, full-grain leather. High-quality features include premium nylon thread stitching, moire fabric lining, and a six-window insert for your ID and photos. This genuine leather checkbook cover also includes a clear duplicate check divider, slip-in personal check pocket, and a second pocket to hold cash or receipts. 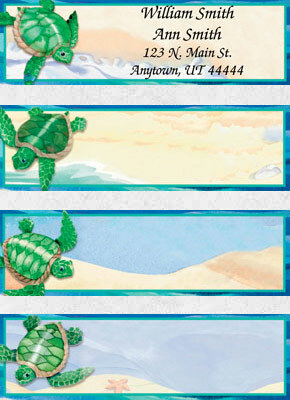 Get your Turtle Tides checkbook cover from Bradford Exchange Checks(R) as soon as possible! Order now! These Artistic Turtle Labels Are Sure to Make a Splash! – Even when the tide rolls in, sea turtles can roll out when they’re on these colorful address labels featuring the artwork of Paul Brent! Your favorite shelled sea life is featured on each of these address labels and is paired with your personal information, making your labeling projects a day at the beach! Plus, you’ll find these sea turtle labels are amazingly practical too, arriving in bound check-sized booklets of 150 conveniently self-sticking labels. They’re perfect for hundreds of jobs, so don’t wait! Make a splash with these sea turtle labels – order now! Just in case any parents out there are planning on getting your kids turtles for Christmas, here is a last minute Friday Find – a care DVD you can order to gift with the turtle! Sorry for the lack of Friday Finds columns! It’s been a little crazy around here as we sleep train our little one… Didn’t realize I missed getting a few new posts up. This week, I love this Friday Find! How cute is this turtle doorstop? Definitely need one in my stocking! It’s always highly likely you’ll find jewelry in the Friday Find column. Seems like a lot of turtle related jewelry is made. However, this week’s find is so cute, I may ask for one in my stocking myself (and I already make jewelry in my spare time)! Green turtle necklace is an unexpected accessory. A green Swarovski crystal flower is surrounded by tiny gold spheres. Dangling freely beneath the flower is a small brass turtle charm. This pendant, which measures 1 inch long, hangs from a 14k gold filled chain. The 16 inch chain fastens around your neck with a spring ring clasp.